March 20 - April 19 : You may have the urge to be creative in the near future, but avoid it as the human master may suspect your ill. Don't view this as a sign to stop pursuing your artistic dreams. The underlying truth is the docility that you display so well tries to manifest in the expected oppression that is expected of you - Don't let others in the herd inhibit where you want to graze. July 22 - Aug. 22 : Times are changing. You should try and delay your search for love and romance. Come to realize that there is more to life than just the Bovine you crave, a relationship with them will not show and display what you truly need. This is a time which you must listen to the voices of the Herd and think about your heirchy therein. Once you find an equilibrium, you can surely seek out your mate. Nov. 22 - Dec. 21 : Slow Down! The things you're doing are confusing the herd, and bewildering the calves. Try and be more sensitive to others' needs, and use a more calculated approach to life today. You will discover that there is a higher level of Docility that you can achieve which eliminates the need to be so active. Be willing to open up to less productive ways. Go after that which you desire, unless it involves work on your part. April 20 - May 19 : It's best you don't know what is going to happen to you and your closest friends soon. Suffice to say, the ones that bothered you the most will suffer the same fate, but you won't be able to enjoy it for long. It wasn't too late to prevent the future some months ago, however it seems the advice I gave you then wasn't correct. 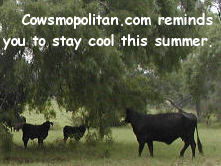 Cowsmopolitan.com apologizes profusely for this mistake. Aug 23 - Sept. 21 : The time is now to bring forth a burst of creative energy into the herd. You'll find that your outgoing personality and love for life will bolster the attitudes and aesthetics of all that are around you. As you try your best to impress, be sure not to forget to stop every now and then and chew the cud. Don't let others' anxiety cause you to prevent anything you wish to accomplish. Dec. 22 - Jan. 19 : Just sit back and observe the behavior of the rest of the herd. Take a good long look how they graze, unaware of the things you believe in. Figure out what makes them unaware to this all, and then you can learn a great deal why you are so unique. Consider yourself a role model, but don't try to get anyone to emulate you. Think about the traits you exhibit that others in the herd should adopt to their own persona. May 20 - June 20 :Say goodbye to your friends that are a Taurus. You'll find yourself in a rather climactic point in your life right now, as a piece of your innocence will be taken away. The department of love and romance may seem insignificant, but it's all you have, and you should embrace it. Your creative levels have peaked, and you feel a strong urge to discover what else is there - well, there's nothing. Now's the time to get knocked up or knock up a few heifers. Everything else is trivial. Sept. 22 - Oct. 22 : More more selective in which group you graze with today. Don't waste your effort trying to fit into those social groups that don't know you well. It isn't healthy to have selective aims, and you'll find it harder to get motivated, but this is all just fine. This is a time to lay low, to save your energy, to plan, to discuss with the others matters beyond the grain that you eat and the flys on your back. Pace yourself, you have plenty of time. Jan. 20 - Feb. 17 : Your romance life may seem fragile today, but only because your partner is more sensitive than normal. You'll find that his caring and emotional approach enriches the social situation and allows you a deeper connection to them. A magical night is coming up, it's time for you to find a good spot in the field, one where the rest of the herd hasn't defecated too much for sure. Don't listen to the rumors, your partner really loves you. June 21 - July 21 : Fragments of your life have been actively neglected for some time. It's time for you to confront those issues. It will cause you a bit of trouble though, but a little organization and structure will teach you a great lesson indeed. Take care of everything now. Put things in order and be aware your clock is ticking. But don't get too rushed to forget to stop and graze the lushness around you, it won't last forever. Oct. 23 - Nov. 21 : You are one ready for mischief. Your friends that are Cancer will seem to be busy doing things, be sure to spread innocent rumors about them to Libra and defecate in the most beautiful places in the field. Try and always be where the Aries are heading. Everyone may not enjoy your antics, but you will receive great pleasure from it. Feb. 18 - Mar. 19 : Cupid has shot his arrow at your heart today, but missed. Accept the fact that at this time there is no lover for you in the herd. Choose a greater passion and graze in all your free time so that you may fatten up, because I see a great love coming to the herd in the coming months - and you want to be available and acceptable to them.